Entrance is free and everyone is welcome to attend. Space is limited though so make sure you complete the proforma saved here and return it to Dr Mary Shannon at the University of Roehampton (mary.shannon@roehampton.ac.uk) as soon as possible. A copy of the programme is available here. I’ll be popping along too, so please say hello if you happen to bump into me in the queue for the tea trolley. See you there. Some of you may recall the posts on Rudolph Ackermann’s ledgers which appeared on this blog last year and have perhaps been wondering what happened to my plan to transcribe and publish their contents. The Ackermann ledgers project kicked-off back in May 2013, when Dr James Baker was kind enough to share photographs of the original ledgers via his blog. James downloaded his pictures of the ledgers for the years 1812 to 1822 into a public folder in Dropbox, and then asked if there was anyone out there willing to lend a hand with the task of transcribing them into a digital format that would be easier to analyse. I volunteered, feeling that the chance to poke my nose through the records of one of Regency London’s most prestigious publishers was too good to miss, and immediately got cracking with the otherwise unenviable task of copying out thousands of individual financial transactions. Things got off to a flying start and within a couple of weeks I was able to produce a short post setting out my initial thoughts on the first twelve months’ worth of data. The most striking feature of the ledgers at this stage being just how little information they appeared to contain which linked Ackermann directly to the production of large quantities of printed material. I found hundreds of transactions relating to the purchase of picture frames, paper and stationery, but hardly any which could be linked to coppersmiths, manufacturers of inks, typesetters etc. This, combined with the substantial regular payments that Ackermann was making to other printing firms, led me to question whether Ackermann’s business was primarily focused on the publishing and retail of prints, rather than their actual manufacture. At this point I received a letter from Ackermann historian John Ford, who was critical of any suggestion that Ackermann ran anything other than a substantial printing and publishing operation and rather sceptical of any attempt to divine conclusions about Ackermann’s business activities from the fragmentary evidence found within the ledgers. Taking John’s comments on board, I dashed off another post at the end of July last year and then got back to transcribing. It has taken a long longer than I originally anticipated, but I finally have three full years’ worth of data, covering the period June 1818 to May 1822, transcribed and felt it was about time we revisited the Ackermann ledgers. But before we get onto the data itself, it seems sensible to pause for a moment to remind ourselves of what information the ledgers actually contain and the issues associated with their use as a form of historical source material. The ledgers are a record of the payments made to and from the account that Ackermann held with Coutts Bank in London. They are similar to a modern bank statement in some respects, with each transaction being recorded chronologically and accompanied by details of the exact amount paid and the name of any third party associated with the payment. They do not, however, provide a summary of the total balance of the account and therefore while it is possible to calculate whether Ackermann’s credits exceeded his debits, we still do not know how much money he actually had at any given moment in time. There are several complicating factors one needs to consider when attempting to use the ledgers to draw conclusions about Ackermann’s publishing activities. Firstly, that Ackermann used the same account to manage a multifaceted business operation encompassing publishing, carriage-design, art dealership and a drawing school, as well as his regular household expenditures. It is therefore not possible to simply look at payments recorded in the ledgers and assume that they relate to the productions of printed materials. Secondly, that in most cases it is not possible to determine the specific nature of the transactions being made from the account. There is almost no information on the source of payments made by Ackermann into the account and while we are usually given the name of the merchant drawing bills, we have no idea what goods or services were actually being provided. Thirdly, that the names of third parties are not recorded with any degree of constancy and that we are therefore making assumptions, based on cross-referencing data against contemporary trade directories, about who was actually drawing money from the account. Fourthly, that the ledgers only record details of transactions carried out through Coutts Bank and are not a comprehensive list of his financial activities. It seems reasonable to assume that, like all businesses, Ackermann would have maintained a store of petty cash which would also have been used to meet expenses. The substantial amounts being paid into and taken out of the account with Coutts suggests that Ackermann probably used it for larger bills and standing orders only. The data I have transcribed covers the period from June 1818 to May 1821. These were the years in which Ackermann was to publish two of his most memorable caricature-related works, in the form of the second and third installments of the Dr Syntax trilogy, as well as the less enduring Johnny Qae Genus. He also continued to publish prodigious quantities of other material, with an analysis of a bibliography of his surviving works indicating a preference for illustrated topographic surveys and instructional works for amateur artists. He was also to persevere with an attempt to bring the newly imported German technology of lithographic printing into mainstream adoption in Britain and presided over one of the first technical manuals on lithography in 1819. This eye for innovation also brought him commercial rewards on another front, when in 1818 he acquired the patent for a moveable carriage axel which was soon to become incorporated into the standard design of all of Britain’s horse-drawn vehicles. 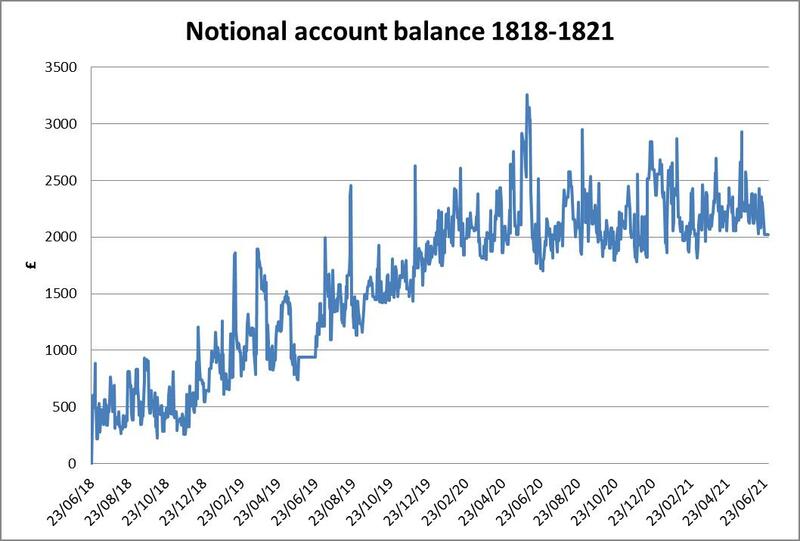 The ledgers seem to confirm that there were profitable years for Ackermann, with the balance of his account increasing by a notional net figure of roughly £3,000 between December 1818 and June 1820. The ledgers also provide a lot of data on the types of goods and services Ackermann relied upon to run his business. His chief area of expenditure appears to have been letterpress printing, which by 1819 amounted to a total cost of almost £5,000 per annum. 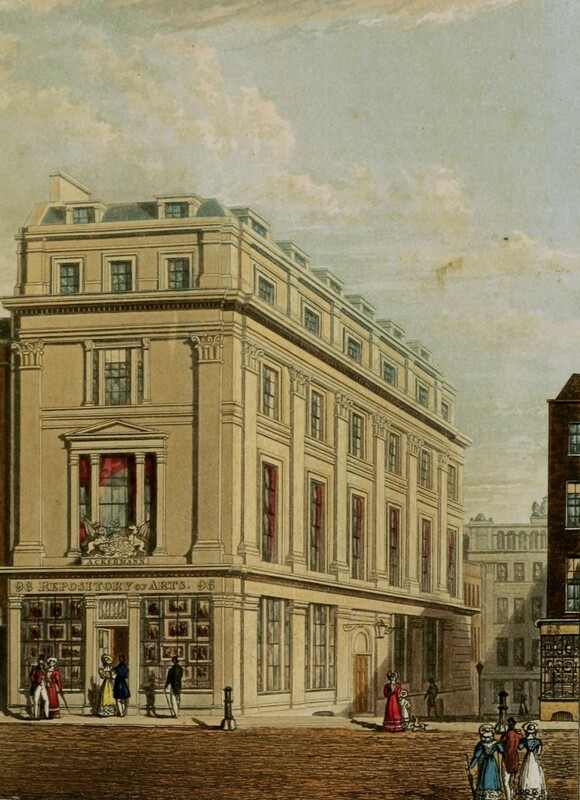 This was chiefly carried out by William Clowes, whose workshop in Northumberland Court, just off the Charing Cross end of the Strand, was located within a couple of minutes walk from the Repository of Arts. 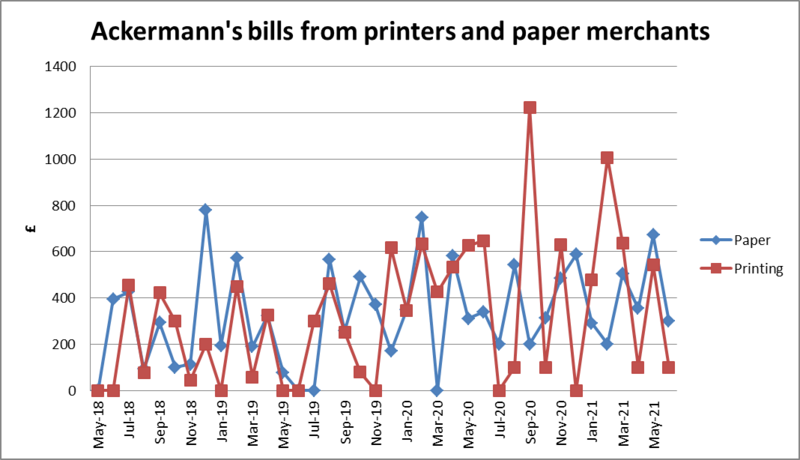 Clowes drew substantial bills on Ackermann’s account at least two or three times a month and these payments give some indication of the scale and intensity of Ackermann’s publishing operations as the evolved over time. Paper was Ackermann’s next largest area of expenditure, with Key & Co of Abchurch Lane being his principle supplier. Large but infrequent payments were also made to two other City paper wholesalers, the firms of Williams & Co and Tipper & Co, who may have been called upon to provide additional materials at times of particularly high demand, or perhaps different grades of paper that were not readily available through Jonathan Key. Ackermann’s consumption of paper appears to have grown steadily over the three years covered by the ledgers, rising from £3,630 in 1818-19 to £4,659 by 1820-21. Disaggregating the data relating to printing and paper and dropping them into a graph reveals that there may be a degree of correlation between the two types of payment. Of course, we have no way of knowing what publications that specific peaks of activity may relate to but it is interesting to note that the release of the complete edition of the Second Tour of Dr Syntax in September 1820 does seem to have corresponded with a significant leap in Ackermann’s printing costs. Ackermann’s payments to the picture frame manufacturers Edward Peirce and John Jacques also raise some interesting questions about the nature of his business. 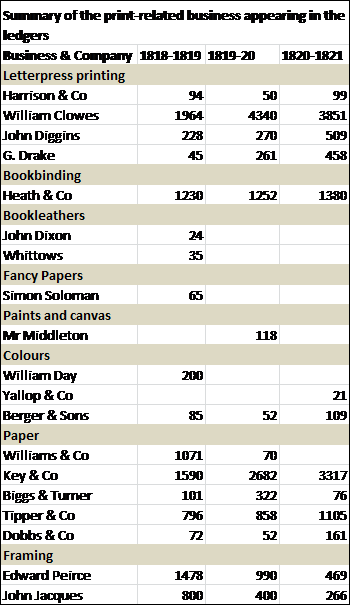 The value of the bills paid to these two merchants during 1818-19 was almost double the amount Ackermann spent on book-binding and almost equalled the amount spent on paper over the same period. The payments than began to tail off during the 1819-20 and by 1820-1 had been reduced to roughly a third of the amount being spent two years earlier. This all seems to suggest that Ackermann was involved in some major project relating to the art gallery side of his business during late 1818 and early 1819, but I must admit that I have been unable to determine precisely what this could have been. The ledgers also contain details of the payments that were made to some of the artists and writers in Ackermann’s circle. These were usually made on an intermittent basis and for comparatively small sums of money, suggesting the creative element may actually have been one of the lowest areas of expenditure associated with publishing in this period. 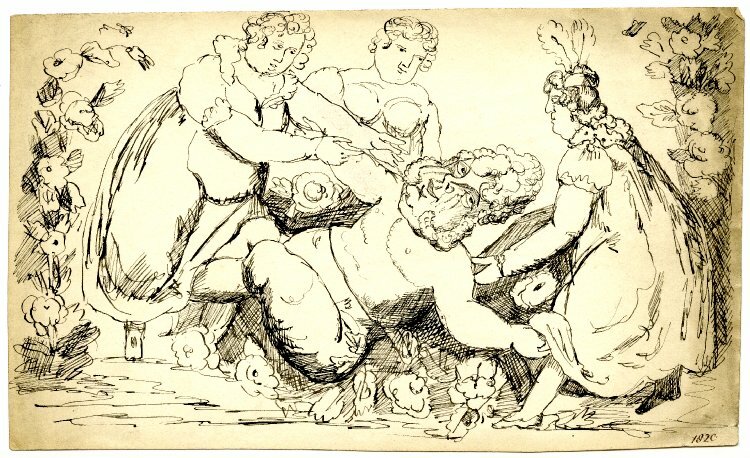 The only exception to this rule was the author William Clowes, who received a regular salary of £33 a month from Ackermann from April 1820 onwards, and was paid substantially more than any other artist in Ackermann’s stable. 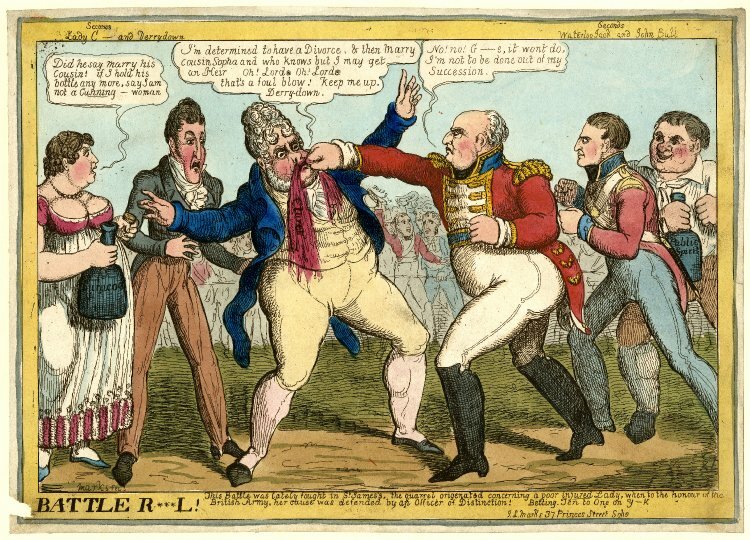 Somewhat surprisingly, Thomas Rowlandson’s name appears only twice, in November 1819 and October 1820, when he received payments of £12 and £45 respectively. Other names that appear include those of J.S. Agar, J.G. Hamilton, Samuel Proutts, Thomas Unwins, J.B. Papworth and J. Cockburn. So what are we to make of all this? 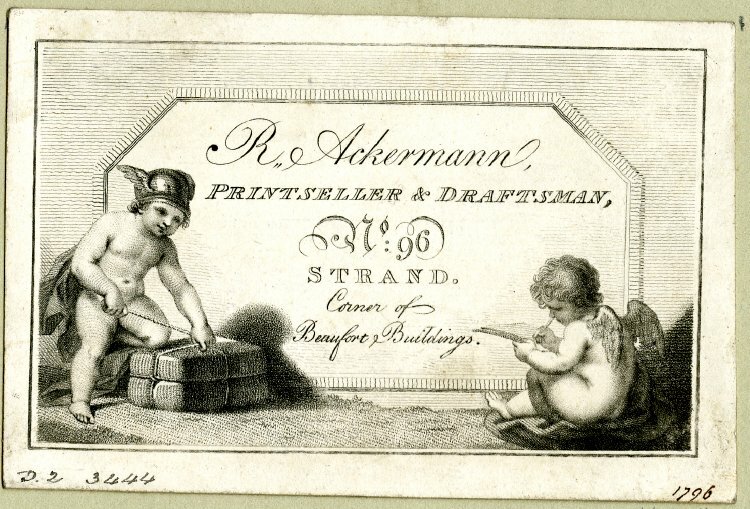 The ledgers certainly allow us to draw some broad conclusions about the overall health of Ackermann’s business affairs and his place within the wider commercial networks of the metropolitan print trade. Further and more rigorous work would be required to determine whether the apparent correlation between paper and printing costs is sustained over a larger data set, and to understand the possible implications of this. A more detailed bibliographic study of Ackermann’s works, including information on advance subscriptions, and the publication dates of successive issues, may also allow us to pinpoint some of the financial transactions associated with specific books. However, this is all work for the future and for the time being anyone who would like to start their own research into the Ackermann ledgers is welcome to take a look at the data I have transcribed. Just click on the research archive link on the left and open the ledgers folder. Good luck! 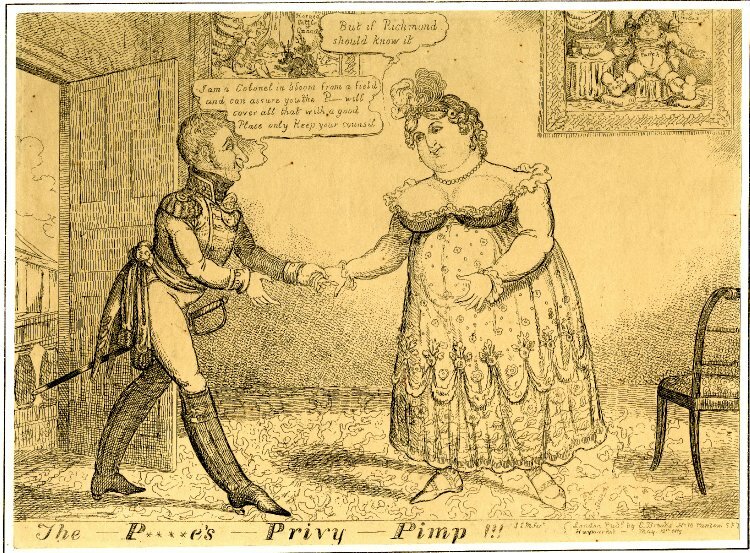 I strongly recommend that you get yourself over to the Lewis Walpole Library blog and check out their newly acquired sets of original pen and ink wash caricatures by Charles Jameson Grant. 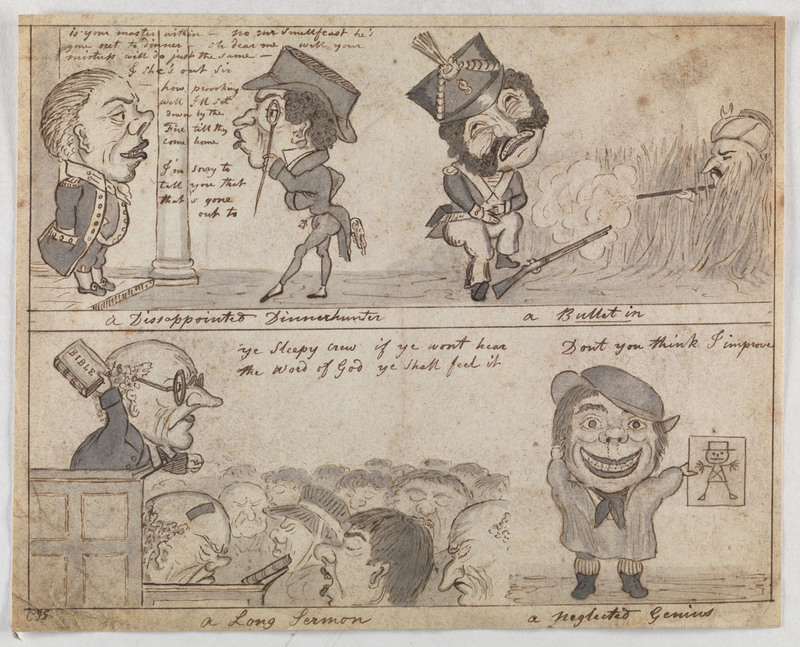 They were part of a set of four unrelated satirical drawings by Grant which was sold at Bonham’s last major sale of caricatures in summer 2010. The hammer price at the time being a cool £4,320. This untitled group of four comic vignettes featuring tiny caricatures with large and grotesquely expressive heads is probably the pick of the bunch. 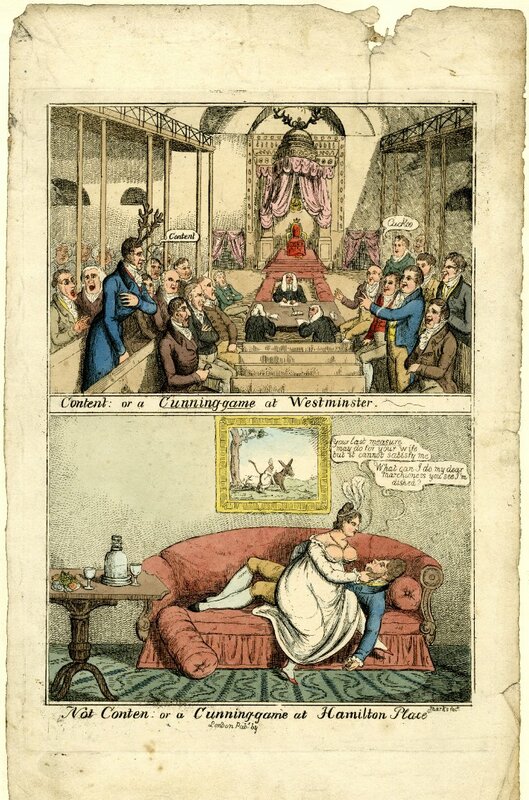 It draws heavily upon a set of similar prints that Isaac Cruikshank and G.M. Woodward produced for S.W. 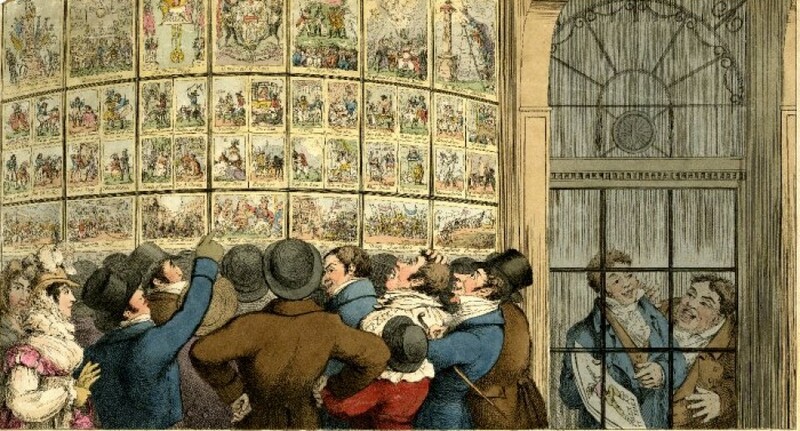 Fores during the late 1790s and early 1800s, most notably the 24 plate Pigmy Revels [sic] series, and provides some indication of Grant’s detailed knowledge of the work of earlier caricaturists. The image on the top right, which shows a British soldier being shot by a sniper in some form of Asiatic dress above the punning caption: “A bulletin”, is interesting as it not only highlights the penchant for dark and violent imagery that Grant would put to such good use in the Political Drama series, but also indicates that stereotypical figures associated with Britain’s colonial wars were beginning to eclipse the French as the traditional bogeymen of British satire by the early 1830s. “No Mr Smallfeast, he’s gone out to dinner”. “… How provoking. Well, I’ll sit down by the fire until they come home”. “I’m sorry to tell you that’s gone out to” [sic].